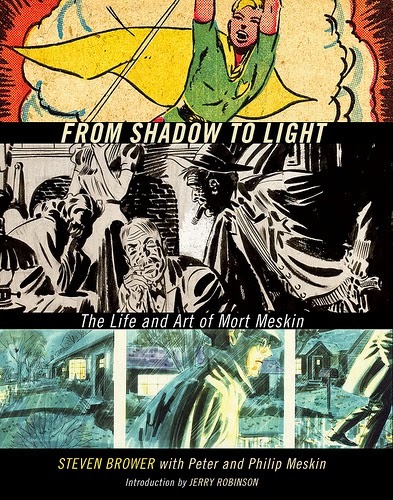 I came across a copy of the Mort Meskin biography From Shadow to Light by Steven Brower in a used book shop. I'd heard Meskin's name before and had read enough old Vigilante stories to be vaguely familiar with his style, but I didn't know much more than that. Not surprisingly, Brower's book shed a lot of light on Meskin for me. Both his personal life, as well as his professional career. And while that was a pretty low hurdle to jump, there was a lot in the book that told me Brower did more than his share of homework, talking to a number of friends and family members specifically for this book. The book flowed pretty seamlessly through Meskin's life, with plenty of examples of his work, both in and out of comics. It was kind of heartbreaking to hear how much difficulty he had throughout much of his life, though it seems he conquered all of his personal demons eventually, and was able to enjoy his retirement. I'm left imagining what he could have accomplished, had he not had to deal with some of the emotional problems he did. Despite clocking in north of 200 pages, it's a surprisingly quick read. Part of that stems from the number of art examples provided, but part of that is also attributable to Brower's casual and accessible writing style. I finished the book easily inside a week, only reading for a little before I went to sleep each night. Meskin's relative obscurity today is unfortunate, given his talent. The book came out in 2010, but doesn't seem to have raised much awareness in the past few years, but I would recommend picking up a copy if you're able. Meskin was very talented, and it's a shame so few people know of him these days. Try not to be one of them.